Federal Appeals Court Tosses Out Texas Voter ID Law : The Two-Way In a unanimous vote, the 5th Circuit ruled that the law, considered one of the toughest in the country, discriminated against minority voters. A sign shows the way to a polling station in Austin, Texas. A federal appeals court has knocked down a state voter ID law. 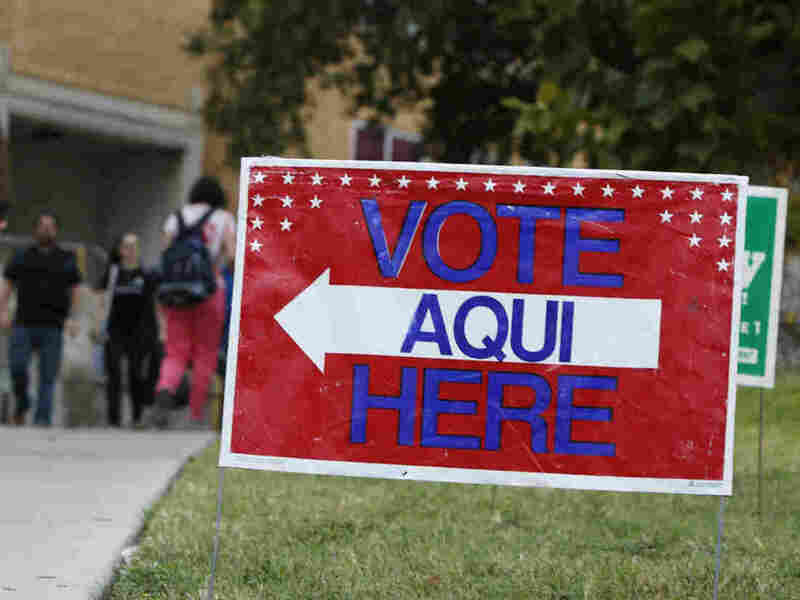 A federal appeals court Wednesday struck down a voter ID law in Texas, saying it violated the 1965 Voting Rights Act. A 5th Circuit three-judge panel ruled unanimously that the law does not equate to a "poll tax" but does discriminate against minority voters. The 2011 law, considered one of the toughest in the country, was in effect during the midterm elections last year. It was one of a handful of voter ID laws enacted in Republican-governed states. The Texas law required voters to provide certain forms of identification before they could cast a ballot. Supporters of the law say strong ID is needed to prevent voter fraud. The law's detractors argue the requirements suppress legitimate voter turnout, particularly among minorities, who tend to vote for Democrats. NPR's John Burnett reported in Wednesday's newscast that the Justice Department had argued that tens of thousands of minority voters would be prevented from casting ballots because they lacked one of seven types of approved ID card. State Attorney General Ken Paxton says he will "continue to defend this important safeguard for all Texas voters." According to the Dallas Morning News, Texas has a few options for how to proceed. "Texas is likely to appeal to the U.S. Supreme Court, but the state also could ask the full 5th Circuit to review the case." The case will now go back to a lower court for further review.